Notes and maps on a group ride, possibly of interest to those who went along (Paul, Marty, Ian, James, Mike, and me) or other cyclists looking for fun and challenging rides in Oregon. Start from the park in Alpine, Oregon for the 66 mile version. 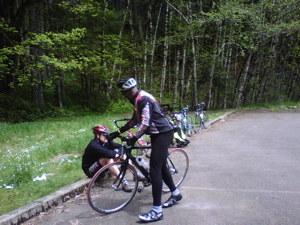 (Mike started in Eugene to make it a 110 mile ride). Turn north on Bellfountain Rd and continue to Decker Rd; left (West) on Decker Rd to Alsea Highway (Highway 34). Left (West/South) on Alsea Highway to the turnoff to Mary's Peak on the right. Up Mary's Peak road. Last section may be closed to car traffic depending on season (opens in April or May). Return down Mary's Peak Road to highway 34. Right (West) on 34/Alsea Highway to town of Alsea. Left (South) on Alsea-Deadwood Hwy, just a few miles. Left (East) on Alsea Hwy. Follow Alsea Hwy past Alsea Falls and back to Alpine. 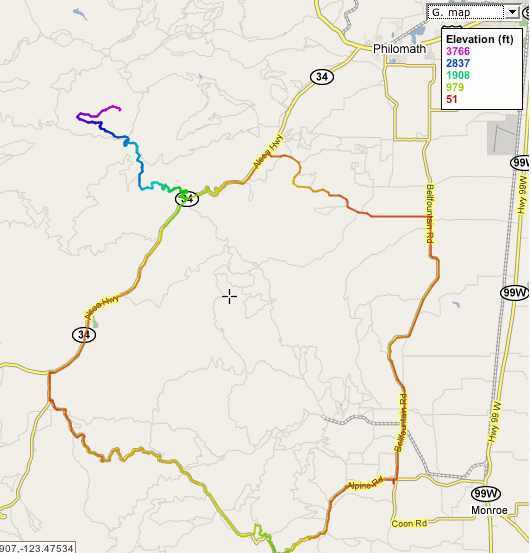 Expect about an hour of steady climbing up Mary's Peak Rd (following some climbing on Hwy 34 to get there). The top is cold and often foggy, even on sunny days. Expect some snow on the road until May (quite a bit at the end of April 2006, very little at the end of April 2007). Bring warm gloves and some kind of coat. No water from Alpine till Alsea; two bottles will probably be enough, but it's a close call. There is a patch of loose gravel about 3/4 of the way up; watch for it on the way down, as well as loose gravel. Use some caution on the descent, because blowing a tire on a sharp stone at 45 would be inconvenient. Alsea is a good (and needed) food stop, with everything from Gatorade to cheeseburgers. 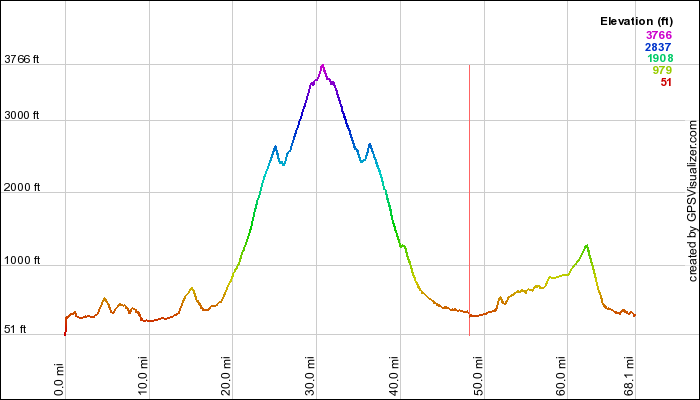 While there is nothing else on the route to compare to the climb up Mary's Peak, there is a long steady climb beyond Alsea Falls and then a long descent on good pavement back down to Alpine. As kmz (open in Google Earth). Based on the open source Sinorca design.